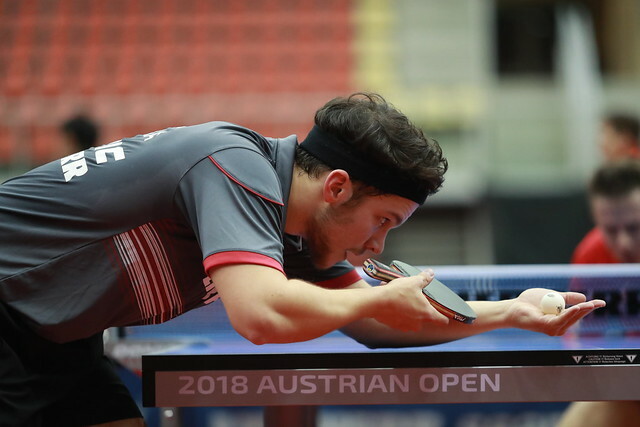 Occupying the top two positions on the Standings, the most successful partnerships of the year, on Friday 9th November at Seamaster 2018 ITTF World Tour Platinum Liebherr Austrian Open in Linz, China’s Chen Xingtong and Sun Yingsha, alongside Japan’s Hina Hayata and Mima Ito, underlined their quality. Both pairs emerged successful at the semi-final stage of the Women’s Doubles event. Chen Xingtong and Sun Yingsha, the no.5 seeds, accounted for Korea Republic’s Jeon Jihee and Yang Haeun, the no.2 seeds, in a full distance five games encounter (11-13, 11-8, 11-4, 10-12, 11-4); rather more comfortably, Hina Hayata and Mima Ito, the top seeds, ended the hopes of Chinese qualifiers Liu Gaoyang and Zhang Rui (11-8, 5-11, 11-9, 11-8). Success for Hina Hayata and Mima Ito meant that a repeat of last week’s final in Sweden was averted when Chen Xingtong and Sun Yingsha had beaten Liu Gaoyang and Zhang Rui to seal the title. Defeats but both vanquished partnerships, prior to the penultimate round starting, both had secured sufficient points to reserve places in the Grand Finals to be staged next month in the Korea Republic city of Incheon. On the Seamaster 2018 ITTF World Tour Women’s Doubles Standings, Jeon Jihee and Yang Haeun will end the year in third place (676 points), two places ahead of Liu Gaoyang and Zhang Rui (475 points). Sandwiched in between is the partnership, also from China, Chen Ke and Wang Manyu (550 points). First place; that depends on the final, Chen Xingtong and Sun Yingshsa presently head the Standings (788 points), followed closely by Hina Hayata and Mima Ito (750 points). The final of the Women’s Doubles event will be held on Sunday 11th November, the concluding day of play in Linz.